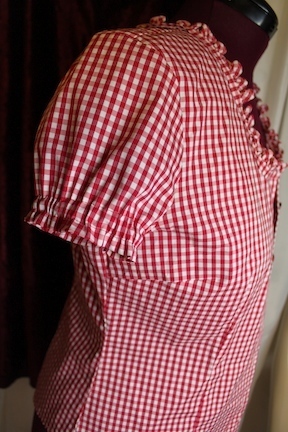 The Ladybug Picnic Blouse was inspired by a top I've owned for at least 7 years, and worn it once about 7 years ago. I'm about 15 lbs heavier than I was then, and I discovered some real problems with the blouse. It looks like a summer blouse, but when wearing it on a summer day, it was too warm, with the long sleeves and high collar. In the fall and spring it just didn't seem like the right time for this top. 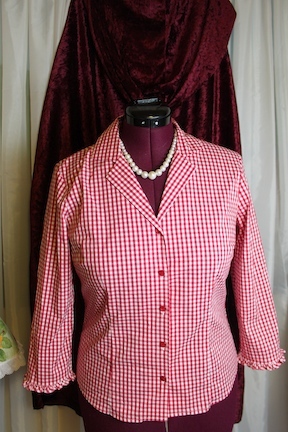 I couldn't bring myself to get rid of the blouse, because I love the fabric, color, and ruffles. For years i've been thinking about some kind of revamping, but couldn't bring myself to cut it. I had the scissors right on the fabric, but couldn't do it. Loved the way it turned out. It was better than I imagined, and not as tricky as I thought it might be. First I laid out all the possible options for this ladybug picnic blouse. Rick-rack or ruffles, shorten the sleeves and add elastic, take the ruffle from the current sleeve, and put it around the neckline or down the front. Replace the buttons with ladybug buttons. These were the options I had in mind. Putting the top on a dress-form helped smooth out wrinkles and make more precise cuts. Not always a priority in redesign, but in this case it was for me. Then find a pattern from something with a neckline I like. 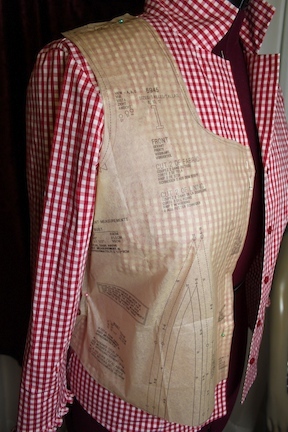 Lay the pattern on the blouse (ideally on dress-form, but could work laid out on table). 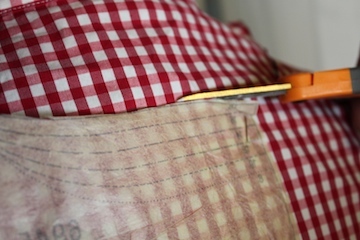 Pin the pattern to the blouse at the shoulder, side and front seams. After smoothing out, I traced the neckline, then carefully cut out the neckline. Then I cut the sleeves to make a short sleeve, and added elastic. Used the ruffle from the sleeve to trim out the neckline. Changed the buttons to ladybug buttons. Been dying to use them.They were a gift from my daughter last Christmas. 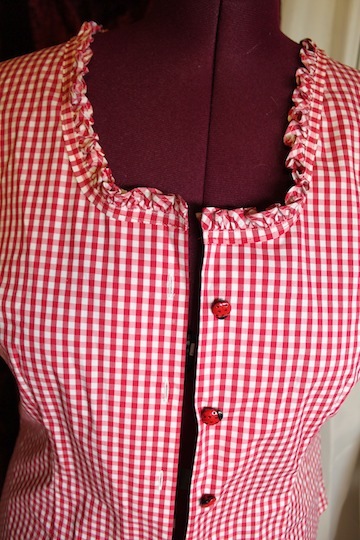 I love the way the ladybug picnic blouse turned out, but it still doesn't fit across the bust area. I'm considering an extra piece of coordinating fabric in front. 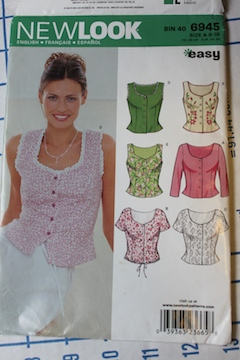 This way I can leave the blouse unbuttoned in front, with what would look like another top underneath. Keep you posted on this one.